Ocean Village Club R17 Updated Unit Make sure to check out our video on the picture page!! Ocean Village Club winner of the 2014 Community of the year!! Anastasia State Park and St. Augustine has been selected by travel writers as one of the best summer family vacation for 2018! Ocean Village Club R17 400 STEPS to OCEAN! View our calendar and 164 "FIVE STAR" Reviews from our guest. Ground floor unit. NO Stairs to climb with all your beach stuff. Parking right at your door!! Ocean Front. We supply all the "Hard to pack" stuff...beach chairs,towels,coolers...Just bring your bathing suit & flip flops!! Cancellation Policy: 30 days prior to arrival 100% refund. When you contact us you will be working with the owner of one unit and will be treated as a guest, with courtesy, respect, and integrity. You will not be just ‘a customer’ of an agency. We are hands on owners and will attend to your every need. Make your reservation today so you don't miss out!! BOOK EARLY FOR THE DATES YOU WANT!! Reserve now for a relaxing, refreshing week or two in this beautiful beach condo. Celebrate an anniversary, birthday, retirement or any other occasion. CELEBRATE LIFE!! You will make wonderful memories and want to return again. If you cannot get away for an entire week consider treating yourself to a three nights stay; you deserve it!!! Come to a fresh, clean, unit and call it home for a week or two! Ocean Village Club is located on the white sandy shores of St. Augustine Beach, on the Atlantic Ocean, in St. Augustine FL, along well-known Highway A1A. The beach is just steps away from your patio door; we have two pools just steps away. Tennis courts are next to the heated pool. We even provided tennis balls. The R Building is one of the last five buildings built in this complex (completed approximately 1999-2000). This also makes it one of the newer oceanfront buildings along this area of the beach. Our ('R') building is one of the four 'oceanfront' buildings in Ocean Village Club. You are only 400 steps away from the ocean. Both pools provide wireless wifi!! When you are not at the beach or pool you will find wonderful St. Augustine, the oldest city in the nation, just 5 miles north of your kitchen door. Named in Forbes magazine as one of the 'ten prettiest towns in America'. National Geographic selected the city as one of the ten best places in the WORLD to see 'holiday lights' between November and January. Come to rest, relax and refresh yourself at the ocean or pools or partake of the huge array of near-by attractions. At this location you have it all, and the choice is yours, the solitude and beauty of the beach, waves and blue skies or the social opportunities that are everywhere--it is up to you! World-class golf courses, the World Golf Village and many famous golf tournaments await you. Orlando/Disney attractions are 1.5 hours south as is the Kennedy Space Center. Daytona Beach, famous on its own, and the Daytona 500 race track is only 30 minutes away. Jacksonville, with all of its cultural events is less than an hour north. Downtown St. Augustine, about 10 min drive, has enough offerings to intrigue you for several weeks; the famous Castillo De San Marcos Fort, St. George Street and all of its shops and open air restaurants, The Alligator Farm, The Fountain of Youth, Ghost Tours, Horse Drawn Carriage Rides, San Sebastian Winery and many, many more. Going the other direction from your condo door you can find almost 300 discount premium outlet shops in two convenient malls. So, whatever your choice, solitude or social, R-17 is the perfect place to call home. We are very much 'hands on' owners; constantly striving to make our unit the very best in every way. Private housekeeper that insures you have an EXCEPTIONALLY clean unit. We supply beach chairs, sand toys, boogie boards, large umbrella, coolers AND BIG beach towels! All the hard to pack things!! This is a ground floor unit, largest interior size available and has handicapped parking immediately outside the door. No stairs to climb. This unit also boasts a SOUTHERN EXPOSURE, so you can enjoy the sun all day long while sitting on our comfortable patio furniture. Take your laptop out to the patio table with your morning cup of coffee; listen to the sounds of the ocean!! Be sure to read our MANY positive guest comments. We are originally from Charleston South Carolina and currently live in Valdosta GA. We LOVE the beach and enjoy it every chance we get!! Ocean Village Club was voted "Best on the Beach". It is a well maintained gated community. Ocean Village Club is very active. Anastasia State Park and Saint Augustine has been selected by travel writers as one of the best summer family vacation for 2018! Ocean Village Club winner of the 2014 Community of the year!! We enjoy being only 400 steps to the ocean’s edge!!! 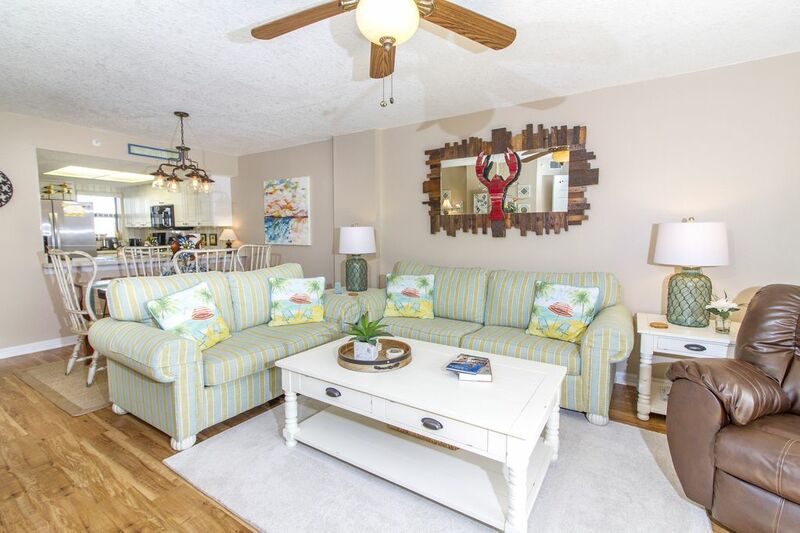 We enjoy the best of both worlds; the beach VERY close to our unit and the historic charming St. Augustine is only about a 10 minutes drive away. Our MOST favorite thing is RELAXING on the beach getting our required daily supply of vitamin Sea!! We enjoy making our condo the very best it can be for your use as a second home. We love making new friends and welcoming them back year after year. In short, we love it all!! Premium linens. oversized towels. plenty of washcloths, towels and bed linens. Parking 20 feet to your kitchen door. Very, Very convenient!! NO stairs to climb with all your beach stuff!! Plenty of High Quality bath towels. Over-sized Beach and Pool towels. Two full sets of dishes. Plastic glasses for the pool, glass for at 'home' Thermal mugs, coolers and two large thermal beverage containers for 'beach' time! 50 inch flat screen HD/TV, DVD player in living room. Flat screen TV's in both bedrooms. Beautiful tropical grassy area right out your back door. Rentals available and awesome Eco tours via kayak, all ages SEGWAYS available downtown AND on the beach !! Rentals available right across the street. Rentals available for your use at local marinas. Many tours by boat, day and evening. Two courts within Ocean Village Club. Resurfaced Nov 2012 Wind screens and benches. Over 100 courses within area. For every level. SawGrass Tournaments close by. Safety Bars Master Shower. Handicap parking right at our door. One Ocean Side Pool with beautiful gazebo and one heated (by tennis courts) AND BOTH pools have wifi access !!! Totally updated unit!! Extra large shower in master bath redone in beautiful marble. Spa like feel. New flooring and furniture in living and dinning room. Quality furnishings. We have a personal housekeeper so the unit is extra clean!! Just bring yourself, your clothes and DON'T forget your swimsuit!! We realize that having a clean and comfortable place to stay is such an important part of any vacation. **Segways are available to rent for the BEACH ! !